Never heard of heli-hiking tours before for a Canadian vacation idea? Don't worry; you're not the only newcomer to this exciting Canadian outdoor activity which allows you to see the sights of Canada up close and from a panoramic view. Heli-hiking is a very popular activity in Canada's national parks, especially those in the Canadian Rockies, whose Canadian terrain lends itself perfectly to the Canadian tours and trips in Canada. 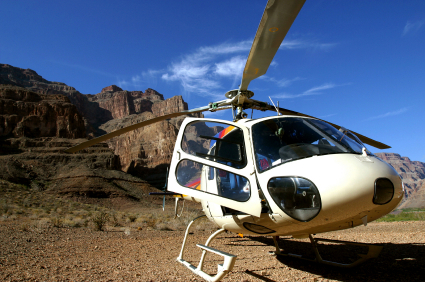 Heli-hiking is just what it sounds like: tours combining sightseeing from a helicopter and hiking. There are numerous heli-hiking tours available in the Canadian Rocky Mountains and if you've never been on a heli-hiking tour, it's an unforgettable experience while on a Canadian vacation in the Canadian Rockies. You can hike through Canadian meadows filled with alpine wildflowers, rugged mountain passes, visit Canadian glaciers and take in the view from the top of a mountain, all in single day trips! During these Canadian vacation packages and tours you'll also be able to enjoy breathtaking aerial views of the Canadian scenery as you travel on your tours from hike to hike. Heli-hiking allows you to cover a lot of ground in a short time, effectively letting you get in several days of hiking and sightseeing tours in the mountains in one and increasing the amount you see on your Canadian vacation. It also makes hiking in the Canadian Rockies and mountains an activity vacation destination that is accessible for the entire family. Even the very young and senior citizens who might otherwise find lengthy hikes up and down the mountains to be too physically taxing can enjoy the Canadian scenery and the fresh mountain air; it's an ideal Canadian vacation tour for any summer family vacation. It's a unique way of experiencing the best that the Canadian Rockies has to offer on your Canadian vacation while still enjoying all the comfort of staying in a Canadian hotel; a factor which makes heli-hiking very appealing to those who just don't find camping to be their idea of a good time for a Canadian vacation. The tours can start in the morning and spend the day hiking while arriving back at your Canadian lodgings in plenty of time to relax and enjoy your evening of your vacation in the Canadian Rockies. If heli-hiking sounds like an activity you want to experience on your next Canadian vacation, Canadian Train Vacations can help. There are Canada train tours available including vacation packages and trips deals that can get you to your heli-hiking vacation destination in comfort and style, allow you to enjoy a day of heli-hiking and other Canadian outdoor activities and relax in comfortable accommodations while you decompress from the stresses of everyday life and drink in the scenery of the Canadian Rockies on your Canadian vacation. There may be no better vacation on Earth! If heli-hiking isn't your cup of tea, don't fret – there are plenty of other trips, tours and vacation packages to enjoy all over Canada. Wherever you'd like to visit on your Canadian train vacation, we can make it happen. Need more information on Heli-Hiking in Canada? Talk to one of our Canadian travel Insiders who'd be happy to answer all your questions.